He is standing on the steps with a pile of cardboard boxes. I count ten, all the same size, and most of them carrying the logo of the company he works for, solid boxes with strong bottoms. This man never tackles any task unprepared, always so organised, precise. If it had been left to me, I would have turned up with three discarded boxes grabbed from the shop on the corner, smelling of bananas and cream biscuits, and totally unsuited to carrying books. I help him pack, standing behind him, as he picks the books off the shelves and arranges them in the boxes. Occasionally, we glance at the title page to see if a book is marked in either of our names; the ones we gave each other are mostly unread. I would have sworn that some of them were his, but I discover from inscriptions in his handwriting inside that they are mine, from him. The travel books are on the lower shelf, an entire row. Childless couples are always travel agencies’ best clients. It is only now that I can discern some pattern in our purchases: Journeys to the Poles, The Arctic Trail, Adventures in Greenland, A Year in Siberia, Hidden Alaska – the entire northern hemisphere disappears into the boxes. I’ve got nothing against the purity of the white universe, but I prefer to be bare-footed in sandals and to travel as light as possible. Geographically speaking, he has always favoured the cold and I the heat. As he examines a series of green icebergs, I skim through a book on the wildlife of a small island in the southern seas that he has left on the shelf. We’re the opposite in the bathroom: I like my showers lukewarm, he likes his steaming hot. That on its own could have explained the absence of children, if I had not systematically taken measures to prevent their conception. One of the best things about being a woman is you can at least have some control over the unforeseeable. He occasionally browses through a book or opens one at random and silently reads, moving his lips. I’ve never seen him do that before. “Listen to this,” he says, reading some account of a struggle with a polar bear from some old memoir of an exploration to Greenland. This is something he has never done either, read out to me. He’s changing, is a changed man, he’s expecting a child. I pretend not to see him when he packs away some books I received as prizes for being equally good at everything, for not being particularly good at anything more than anything else, for finding it difficult to prefer one thing more than another, for not knowing exactly what it was that I wanted at that point in my life. Which probably hasn’t changed much. I would have thought the ten boxes he came with would have been sufficient to contain our entire collection of books, but apparently not, there are plenty left, almost half, in fact. “There are some pages missing from this one,” he says. “Doesn’t matter now,” I say. I can’t remember exactly how it happened, whether I inadvertently hit him as I was stretching out for the foreign thesaurus I had recently bought and which he was accidentally packing, but was clearly too specialised to be of any interest or use to him, or whether he got hit as he was trying to dodge me with a box. “No, I’m sorry,” he says at the same moment as a siren is heard outside. It’s a well-known fact that certain extraneous circumstances, such as the sound of an ambulance siren or the blinking of fire brigade lights, can create an unexpected intimacy between two people in the face of a common external unknown, giving rise to questions such as who, how, why, how much, how old, inside, outside? The shudder provoked by the prospect of an unknown crime or accident can push people closer to each other. Empathy with a victim can even lead an estranged couple back into each other’s arms again. At this dark hour of the day, there is barely a child playing outside. Let us imagine instead that it was an old-age pensioner, who forgot how to open his door from the inside, couldn’t undo the safety latch to get outside or slipped on the wet tiles of his bathroom after the help had left him. Whatever it was, we suddenly found ourselves naked on the leather sofa and were swiftly done with it, after which I helped him sellotape the boxes. I was right, ten boxes represent half of the house’s books; my husband is so precise and meticulous. Then we order a Thai takeaway, which we eat with the plastic forks it came with, straight out of the boxes. This means that Nína Lind will be sitting on this leather with her crisps to watch the latest Danish series on TV, unaware of the sofa’s history and its contribution to the multiple pleasures of conjugal life. She probably won’t even realise that I translated the series’ subtitles. He is more than welcome to take away this bachelor set, with its downtrodden cushions and over-upholstered armrests. I prefer something more Spartan. “Nína Lind and I were thinking of driving out of town, our last chance to see the autumn colours,” says the man who up until now has never particularly vented any thoughts on the seasonal colours of the earth. “I think they’re forecasting warmer weather and rain,” I say, suddenly realising that my conversations with other people have now been reduced to passing on meteorological information. The sleeping bags are still zipped to each other since our camping trip in the summer. The giant bag will resuscitate my scent for him, traces and odours of moss, traces of me. I can’t imagine guest houses being overbooked in November, even the migrating birds have left the country by now. After we’ve taken ten trips with the boxes out to his company van, he stretches out his hand and I take it, wishing him a nice journey. This is the third time he’s said this to me in as many days. Someone ought to tell him he is starting to repeat himself. He leaves his wedding ring on the shelf on top of a pile of unpaid bills and turns towards the doorway. After this final wash, it will just be a matter of conscience whether I do his laundry in the future or not. From Butterflies in November, translated by Brian FitzGibbon and published by Pushkin Press. Auður Ava Ólafsdóttir was born in Iceland in 1958, studied in Paris and has lectured in History of Art at the University of Iceland. She is the author of four novels and a collection of poetry and lives and works in Reykjavik. 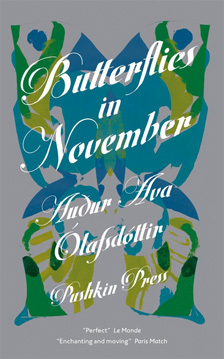 Butterflies in November, her first work to be published in English, is a blackly funny and deeply moving story of a newly dumped narrator who agrees to take care of her friend’s deaf-mute son on a winter roadtrip around Iceland. Winner of the City of Reykjavik Literary Award when originally published in 2004, a film is now in development to be shot in English with an international cast.